Where did the pedestrian cross the road? Unless he or she’s a jaywalker, at the crosswalk of course! 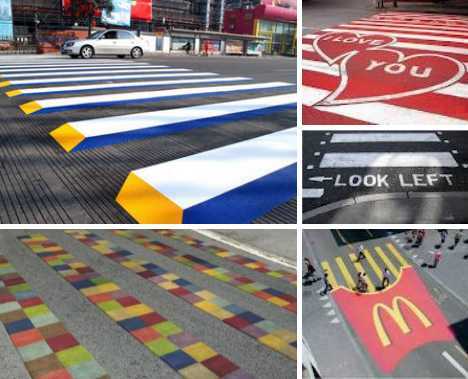 These ten creative crosswalks or, as they’re known in Europe, Asia and elsewhere, Zebra Crossings, are as much a part of modern society as bar codes and show just as much clever variation. Crossing the street in China can be an adventure in itself, albeit one that doesn’t always come to a satisfying conclusion, and those who venture across run-of-the-mill black & white crosswalks in the central Chinese city of Chengdu don’t always get the respectful attention they deserve from drivers. Enter the Love Zebra Crossing, literally, and you’re at least assured of leaving this world in the arms of your one true love. 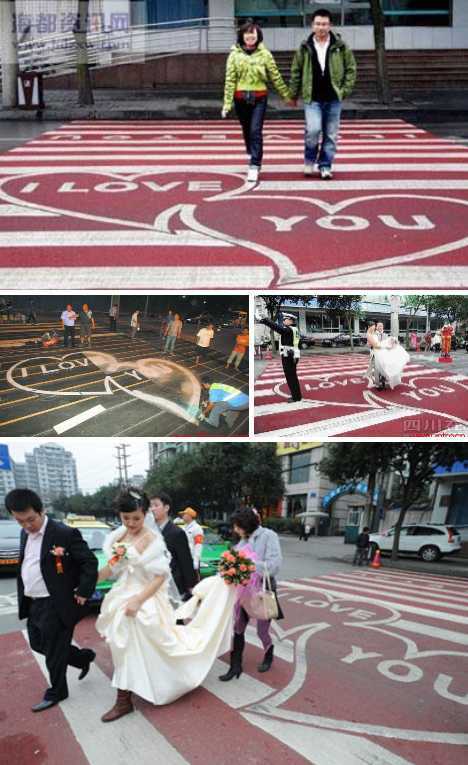 Big, bold and beautiful, Chengdu’s Love Zebra Crossing was set up in an area of town close to where two rivers meet – get it? The crossing has proven to be so popular its presence has actually increased pedestrian traffic, some of whom dress for the occasion. We’re not sure how Chinese drivers feel about the design but one hopes it’s not a hit. Kudos to the kids at West Seattle’s Lafayette Elementary School for this triumph of street-level urban design and a pat on the back to Dennis Ross of the Admiral Neighborhood Association for coaxing the city’s beancounters into funding the project. View more images of the crosswalk at Jet City Orange‘s Flickr photostream. 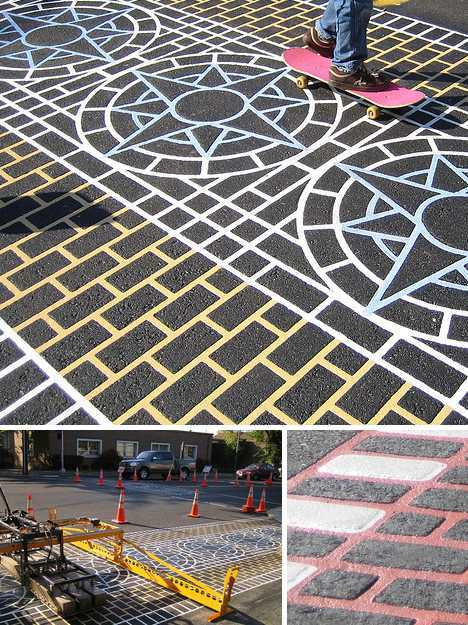 Though the intricate design appears to have been applied with colored chalk, it’s actually Dura-Therm, a pavement marking system that involves impressing a pattern into softened asphalt, filling the impressions with special plastic, then melting the plastic through a heat-transfer process. 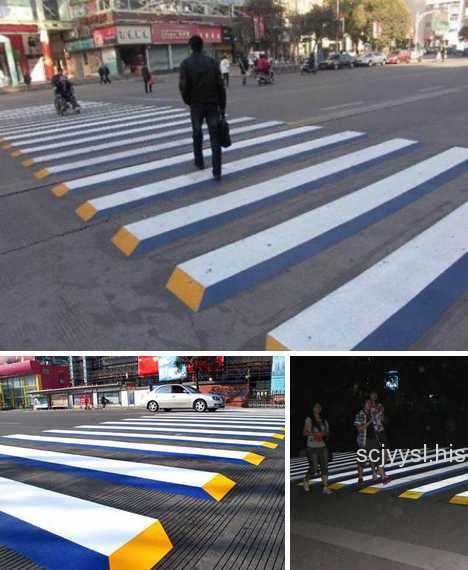 Now here’s a crosswalk we’d like to see, and if the future of zebra crossings is this bright then by all means you’ve gotta wear shades! 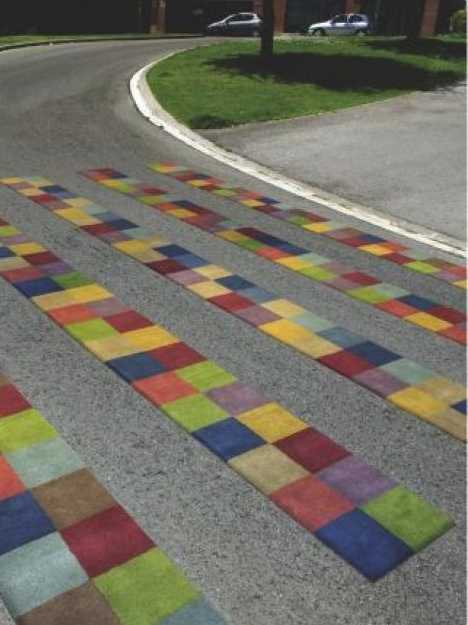 Alas, the colorful crosswalk never progressed beyond a 2004 print rendering by the Contrapunto advertising agency for a road safety campaign conducted by Mataro City Council in Mataro, Spain. When is a crosswalk not a crosswalk? 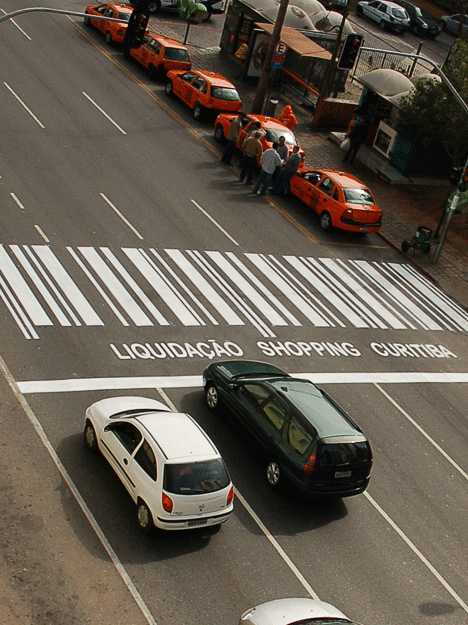 When it’s a guerrilla art advertisement for Shopping Curitiba, a shopping center in the city of Curitiba, Brazil. 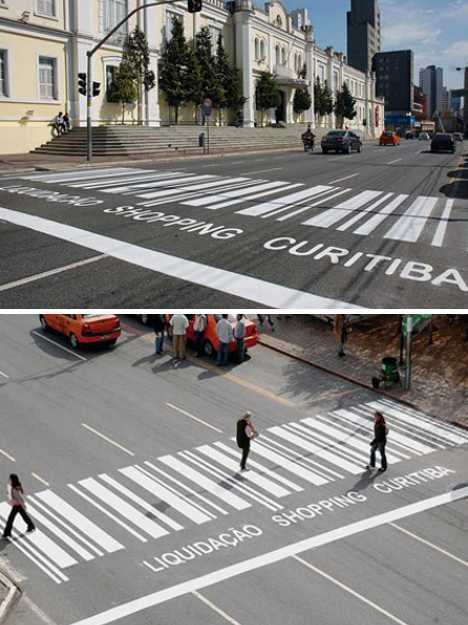 Shopping Curitiba applied for and received a special authorization from Curitiba’s City Hall to place the ad for a limited time in August of 2007. The ad was designed by Diego Pianaro and Cintya Reese of the OpusMúltipla agency. After the sale the faux crosswalk was painted over, and there were no reports of any pedestrians faking injuries during its operation. Think the spicy food in Sichuan, China jumps out at you? Try driving home after your meal. The blue, white & yellow zebra crossing shown here is, dare we say, overkill when it comes to grabbing drivers’ attention… not to mention the effect on drunk pedestrians trying to negotiate it. 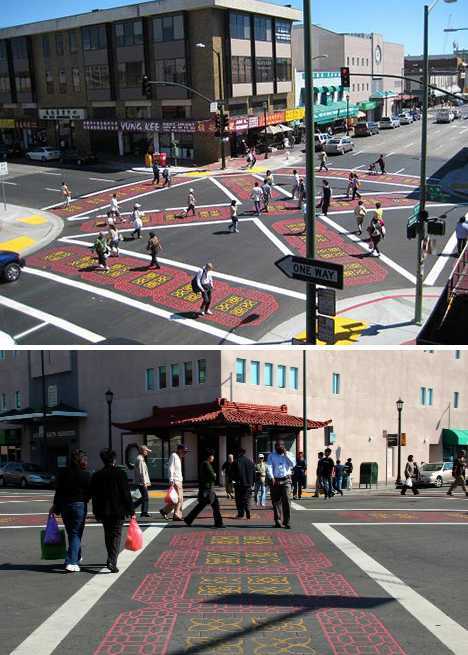 What looks like a giant board game at the intersections of 8th and 9th at Franklin and Webster Streets in Oakland’s Chinatown is actually one of four new pedestrian “scrambles” intended to cut down on accidents and injuries when traffic gets heavy. The intersection’s traffic signal lights have been retimed and now feature a 15-second all-pedestrian phase. It’s called a scramble because during the 15 seconds when vehicular traffic stops, pedestrians are free to cross in any direction including diagonally. 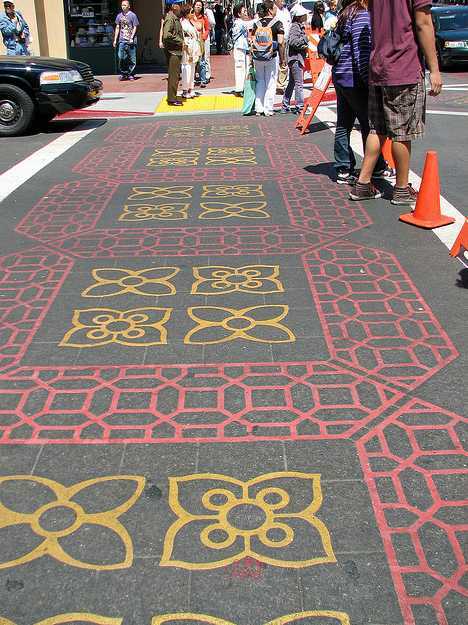 The intersection above comes alive with colorful crosswalks designed by Cleveland-born artist Deb Roby. 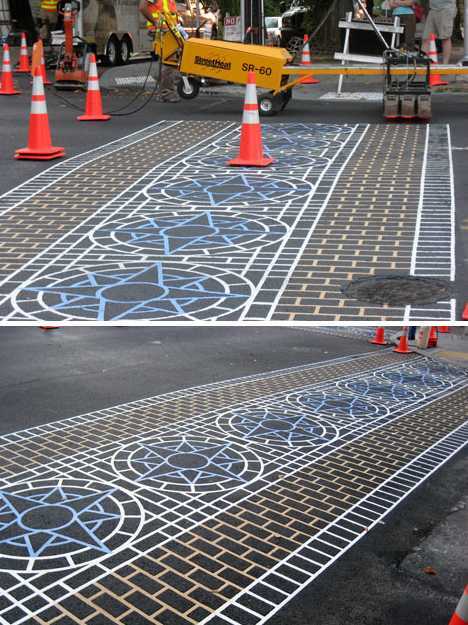 But this crossing has seen quite a bit of controversy despite the beautiful road markings. There have been a few accidents involving pedestrians because drivers get confused about the “scramble” that happens. If you have been hit while using a crossing then you might want legal representation from someone like this Forth Worth Personal Injury Lawyer to see if you could get compensation for what happened. Perhaps all this crossing needs are clearer signs for the drivers to explain how the system works. 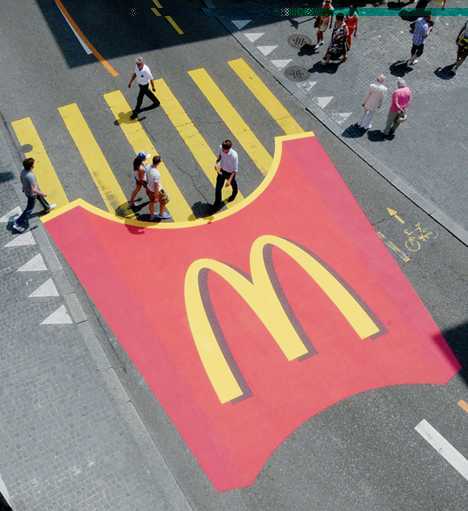 During the 2010 edition of Zurichfest, Switzerland’s largest public festival, McDonald’s made sure festival-goers got fries with that, and by “that” we mean the act of walking across the street. One has to wonder, though, if the advertorial art would be in better taste in winter when the roads are salted. 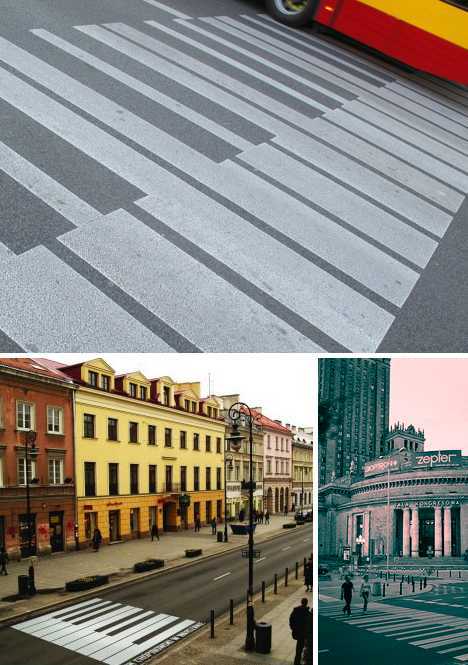 Ah, the music of the streets… and if the streets are in Warsaw, the music must be Chopin. 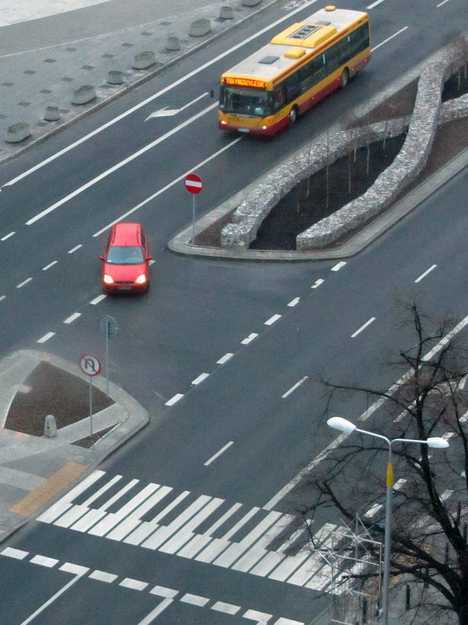 In honor of the 200th anniversary of the Polish-born composer’s birth in 1810, the City of Warsaw repainted a significant number of zebra crossings to resemble piano keys. With the anniversary looming and pressure rising to suitably commemorate one of the city & country’s favorite sons, the City of Warsaw Promotion Bureau and the Department of Industrial Design at the Fine Arts Academy of Warsaw decided to hold a design competition and invited submissions. 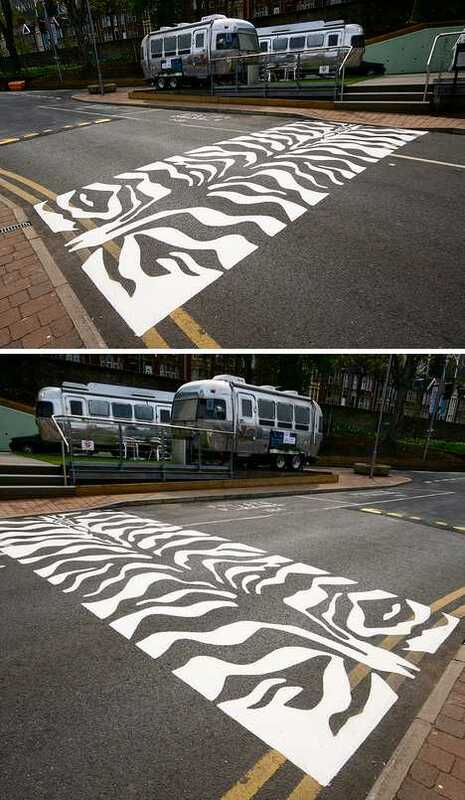 The simple yet evocative zebra crossings were conceived by Helena Czernek and Klara Jankiewicz. Someone at the Paintworks Centre near Arnos Vale, Bristol, UK has a wicked sense of humor and, of course, access to copious amounts of white paint. Perhaps we should consider ourselves lucky as things could have been worse: the UK also has Toucan Crossings, Pelican Crossings, Puffin Crossings, Tiger Crossings and Penguin Crossings… but unaccountably no Chicken Crossings. 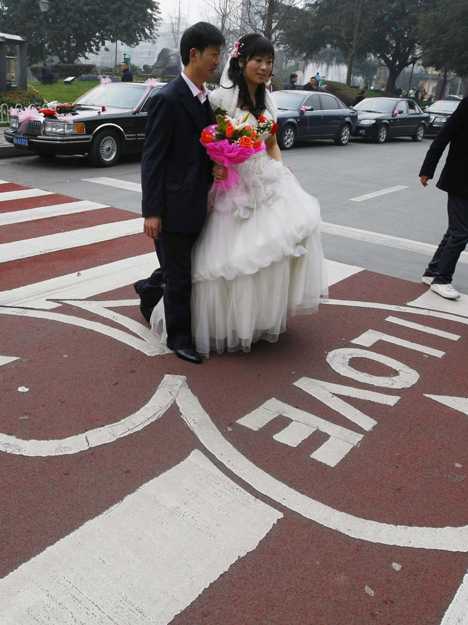 The intersection of Fengzhuang Road at Nansan Road in Zhengzhou, China, sends mixed messages to puzzled pedestrians. 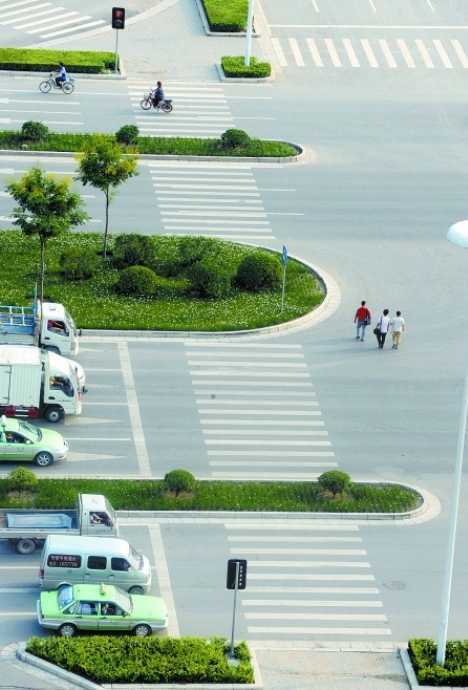 Does one cross Fengzhuang Road on the zebra crossing or risk being ticketed for ignoring “Keep Off the Grass” signs? Judging from the pedestrians depicted above, the answer is “neither”. 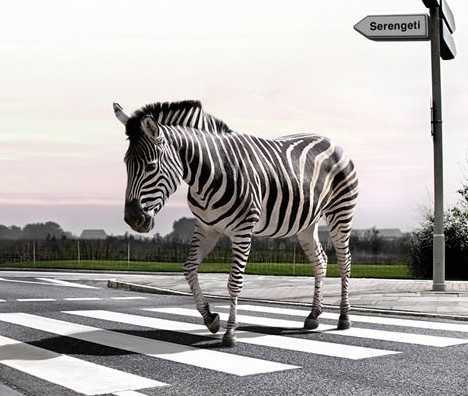 Who’s to say there aren’t zebras crossing at any of the world’s many zebra crossings at any time? Would we be able to see them if they were? Then again, would drivers? Guess you’re not so smart after all, are you, zebras?